Another coenzyme commonly involved in energy-producing metabolism, derived from the vitamin niacin, is the pyridine nucleotide, NAD (Nicotinamide Adenine Dinucleotide). The basis for chemical transformations of energy usually involves oxidation/reduction reactions. For a biochemical to become oxidized, electrons must be removed by an oxidizing agent. The oxidizing agent is an electron acceptor that becomes reduced in the reaction. During the reaction, the oxidizing agent is converted to a reducing agent that can add its electrons to another chemical, thereby reducing it, and reoxidizing itself. The molecule that usually functions as the electron carrier in these types of coupled oxidation-reduction reactions in biological systems is NAD and its phosphorylated derivative, NADP. NAD or NADP can become alternately oxidized or reduced by the loss or gain of two electrons. The oxidized form of NAD is symbolized NAD; the reduced form is symbolized as NADH, NADH2 or NADH + H+. The structure of NAD is drawn below. Figure 3. The Structure of NAD. (a) Nicotinamide Adenine Dinucleotide is composed of two nucleotide molecules: Adenosine monophosphate (adenine plus ribose-phosphate) and nicotinamide ribotide (nicotinamide plus ribose-phosphate). NADP has an identical structure except that it contains an additional phosphate group attached to one of the ribose residues. 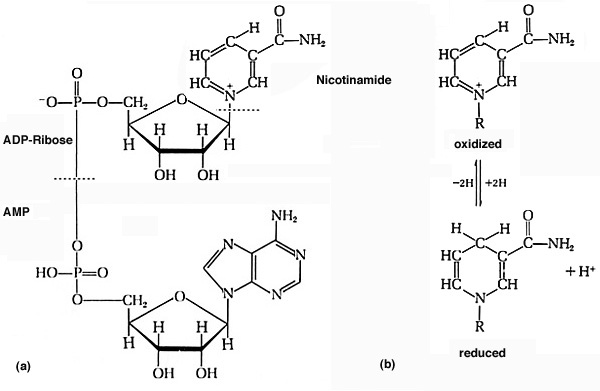 (b) The oxidized and reduced forms of of the nicotinamide moiety of NAD. Nicotinamide is the active part of the molecule where the reversible oxidation and reduction takes place. The oxidized form of NAD has one hydrogen atom less than the reduced form and, in addition, has a positive charge on the nitrogen atom which allows it to accept a second electron upon reduction. Thus the correct way to symbolize the reaction is NAD+ + 2H----->NADH + H+. However, for convenience, we will hereafter use the symbols NAD and NADH2. Many bacterial protein toxins including the cholera toxin, pertussis toxin and diphtheria toxin, exert their enzymatic activity using NAD as a co-substrate. The toxins are referred to as ADP-ribosylation toxins, because they cleave NAD into nicotinamide plus ADP-ribose (ADPR) and then transfer the ADPR to some host molecule. For example, the diphtheria toxin transfers ADPR to elongation factor 2, irreversibly inactivating its role in chain elongation during protein synthesis. Thus, the biological activity of the diphtheria toxin is to inhibit protein synthesis in eucaryotic cells. Coenzyme A is another coenzyme frequently involved in energy-generating metabolism of procaryotes. Coenzyme A is involved in a type of ATP-generating reaction seen in some fermentative bacteria and in all respiratory organisms. The reaction occurs in association with the oxidation of keto acids such as pyruvic acid and alpha ketoglutaric acid. These substrates are central to glycolysis and the TCA cycle, respectively, and they are direct or indirect precursors of several essential macromolecules in a cell. The oxidations of pyruvate and alpha ketoglutarate, involving Coenzyme A, NAD, a dehydrogenation reaction and a decarboxylation reaction, are two of the most important, and complex, reactions in metabolism. Figure 4. (a) The Structure of Coenzyme A. CoA-SH is a derivative of ADP. The molecule shown here attached to ADP is pantothenic acid, which carries a terminal thiol (-S) group. 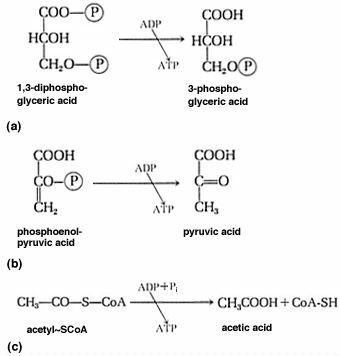 (b) the oxidation of the keto acid, pyruvic acid, to acetyl~SCoA. This is the reaction that enters two carbons from pyruvate into the TCA cycle. In the oxidation of keto acids, coenzyme A (CoA or CoASH) becomes attached through a thioester linkage (~S) to the carboxyl group of the oxidized product. Part of the energy released in the oxidation is conserved in the thioester bond. 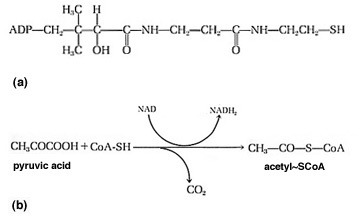 This bond energy can be subsequently used to synthesize ATP, as in the case of the clostridia that convert acetyl~SCoA +ADP + Pi--------> acetic acid + CoASH + ATP. Or in the case of respiratory organisms, the thioester bond energy is expended when acetyl~SCoA condenses with oxalacetate in order to drive the TCA cycle into its oxidative branch. The objective of a catabolic pathway is to make ATP: to transform either chemical energy or electromagnetic (light) energy into the chemical energy contained within the high-energy bonds of ATP. Cells fundamentally can produce ATP in two ways: substrate level phosphorylation and electron transport phosphorylation. Substrate level phosphorylation (SLP) is The simplest, oldest and least-evolved way to make ATP. In a substrate level phosphorylation, ATP is made during the conversion of an organic molecule from one form to another. Energy released during the conversion is partially conserved during the synthesis of the high energy bond of ATP. SLP occurs during fermentations and respiration (the TCA cycle), and even during some lithotrophic transformations of inorganic substrates. Figure 5. Three examples of substrate level phosphorylation. (a) and (b) are the two substrate level phosphorylations that occur during the Embden Meyerhof pathway, but they occur in all other fermentation pathways which have an Embden-Meyerhof component. (c) is a substrate level phosphorylation found in Clostridium and Bifidobacterium. These are two anaerobic (fermentative) bacteria who learned how to make one more ATP from glycolysis beyond the formation of pyruvate. Electron Transport Phosphorylation (ETP) is a much more complicated affair that evolved long after SLP. Electron Transport Phosphorylation takes place during respiration, photosynthesis, lithotrophy and possibly other types of bacterial metabolism. ETP requires that electrons removed from substrates be dumped into an electron transport system (ETS) contained within a membrane. The electrons are transferred through the ETS to some final electron acceptor in the membrane (like O2 in aerobic respiration) , while their traverse through the ETS results in the extrusion of protons and the establishment of a proton motive force (pmf) across the membrane. An essential component of the membrane for synthesis of ATP is a membrane-bound ATPase (ATP synthetase) enzyme. The ATPase enzyme transports protons, thereby utilizing the pmf (protons) during the synthesis of ATP. The idea in electron transport phosphorylation is to drive electrons through an ETS in the membrane, establish a pmf, and use the pmf to synthesize ATP. Obviously, ETP take a lot more "gear" than SLP, in the form of membranes, electron transport systems, ATPase enzymes, etc. A familiar example of energy-producing and energy-consuming functions of the bacterial membrane, related to the establishment and use of pmf and the production of ATP, is given in the following drawing of the plasma membrane of Escherichia coli. Figure 6. The plasma membrane of Escherichia coli. 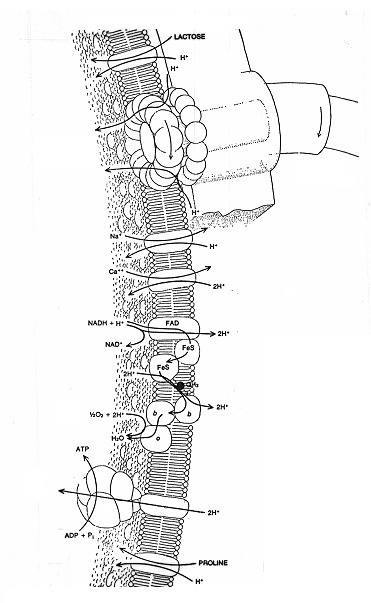 The membrane in cross-section reveals various transport systems, the flagellar motor apparatus (S and M rings), the respiratory electron transport system, and the membrane-bound ATPase enzyme. Reduced NADH + H+ feeds pairs of electrons into the ETS. The ETS is the sequence of electron carriers in the membrane [FAD --> FeS --> QH2 (Quinone) --> (cytochromes) b --> b --> o] that ultimately reduces O2 to H2O during respiration. At certain points in the electron transport process, the electrons pass "coupling sites" and this results in the translocation of protons from the inside to the outside of the membrane, thus establishing the proton motive force (pmf) on the membrane. The pmf is used in three ways by the bacterium to do work or conserve energy: active transport (e.g. lactose and proline symport; calcium and sodium antiport); motility (rotation of the bacterial flagellum), and ATP synthesis (via the ATPase enzyme during the process of oxidative phosphorylation or electron transport phosphorylation).